If you have seen the documentary “King of Kong” which portrays the ever lasting battle for getting the high score on a classic arcade title like Donkey Kong, then you know of the rivalry that exists between players when it comes to being the world record holder. 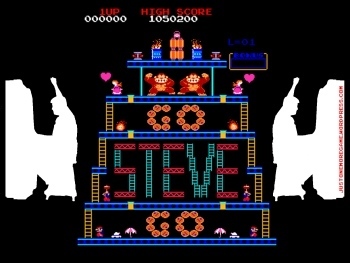 In this particular case between Steve Wiebe and Billy Mitchell, people even take sides as to who they want to see win and while I have not picked a side in this particular competition (I’m probably the only arcade fan out there who has still missed out on seeing KoK), I figure that it’s become one of the more notable rivalries in recent memory and in case you had not heard, Mr. Wiebe took the stage at E3 earlier today to challenge the current high score that is held by Mr. Mitchell. I have not heard how that has come down and I am not sure how long it takes to reach this particular high score in DK but Wiebe fans are cheering him on and have even created a desktop wallpaper to show their support for his effort. I wonder now if Mitchell fans will do this as well (or take it to another level) but in case you want to cheer Wiebe on via your desktop, you can find the wallpapers at Just One More Game. 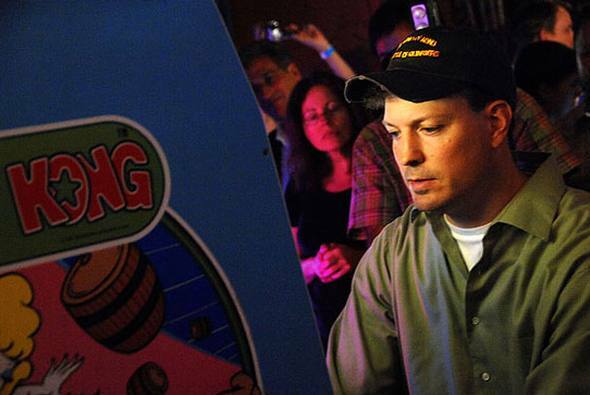 Many people have seen the documentary “The King of Kong” which delves into the world of high-score record setting on classic arcade games and the center of that story revolves around Steve Wiebe. We have mentioned him before and even after that documentary, he continues to make headlines with his awesome gaming skills, this time on Donkey Kong Jr. The first world record on Jr. was set back in 1983 by Billy Mitchell (who still holds the record on the original DK and he holds records on several other games) who was topped 25 years later by Ike Hall only some months ago. Now Mr. Wiebe has toppled that record by 106,800 points with his score of 1,139,800 and it just so happens that he is going to take another shot at the Donkey Kong score at this year’s E3 event. I think it’s great that the attempt to set the world record on a classic game can still generate excitement for people, especially in this day and age where many video games have completely dumped the score system in favor of the “cinematic experience”. Arcades haven’t dumped it of course and I hope that the never do, without a high score board it makes it difficult to call a game an “arcade”. 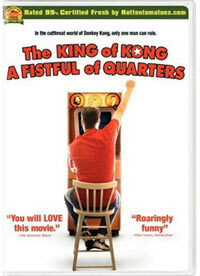 I caught that Amazon has now listed a pre-order for the King of Kong Documentary DVD. For those that don’t know, The King of Kong documented some arcade players in their quest for the highest score at games like Donkey Kong. Now this movie has not come around without some complaints, with some saying that Billy Mitchell is portrayed as a villain but as I have not had a chance to see this yet I can’t comment on that. The DVD will be available on the 29th of January. Now if we could see a few of the other arcade-related documentaries like Chasing Ghosts on DVD too, that would be nice.